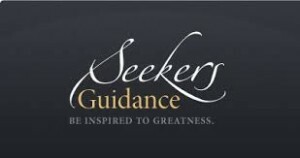 Last night I participated in a live session of a free online Islamic course with seekersguidance.org. The course is a study of the classic work “Treatise of the Seekers of Guidance” by Imam Al Muhasibi, translated by Imam Zaid Shakir. The instructor of my course is Imam Afroz Ali of Sydney, Australia. I cannot stress how awesome an opportunity this has been for me. The courses are FREE, and you learn about the deeper aspects of Islam; how to LIVE Islam in today’s world. I have gained so much beneficial knowledge just from the few weeks I’ve been taking this simple yet enlightening course. One topic that Imam Afroz discussed yesterday was that of how our emotional hardships (negative feelings we go through) can be a way to purify our hearts IF WE CHOOSE THE RIGHT REACTION. The right reaction to negative feelings is to feel patient and content WITH THE DECREE OF ALLAH (SWT). If we are feeling negative feelings for a prolonged period of time, we need to check ourselves–because that means that we are not being content with the DIVINE DECREE. So the response of a believer to negative feelings (anger, sadness, etc.) is Patience and Contentment. Masha Allah , I’m happy to heard about this site the offer free courses to Muslim ummah without you shaima i will going to lose a lot of knowledge may Allah bless you increase in knowledge forgive you your entire sins. May Allah bless you for your kind and encouraging words and give you the same and more.